Dias: "I'm very confident that Ford is going to honor its commitment to its workers in Canada." 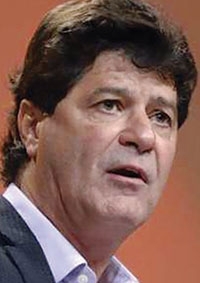 Unifor President Jerry Dias said he is not concerned about potential job cuts under new Ford Motor Co. CEO Jim Hackett, who oversaw about 12,000 layoffs during his tenure as the head of office furniture company Steelcase Inc.
Dias said he does not expect Hackett to replicate his approach at Steelcase, which moved much of its production from the U.S. to Mexico under his watch. That's because the political climate in Canada and the U.S., fresh off a populist wave in the 2016 presidential election, has changed drastically in the past few years, he said. "Citizens of the United States and Canada are now much more cognizant of the fact that we got screwed under NAFTA," Dias said in an interview with Automotive News. The union's new contract with Ford, which it negotiated last year and secures $713 million in investments in its Canadian operations, would also serve to protect against potential job cuts in the wake of slumping Ford shares and a weakening U.S. marketplace, he said. Unifor represents about 6,400 Ford workers in Canada. "I'm very confident that Ford is going to honor its commitment to its workers in Canada," Dias said. "Ford is a stand-up company. I'm not concerned." Hackett was hired Monday as CEO of Ford as part of a sweeping leadership shakeup. Hackett, 62, replaces Mark Fields, who is retiring after less than three years at the helm amid shareholder pressure and a weak performance on the stock market. Hackett made a name for himself as CEO of Michigan-based Steelcase, where he oversaw thousands of job cuts and plant shutdowns as part of a substantial reorganization of the company. After retiring from Steelcase, he became interim athletic director at the University of Michigan, where he was credited for turning around the fortunes of its football program with the hiring of head coach Jim Harbaugh. Hackett then spent the past 14 months as the head of Ford's mobility subsidiary. Dias put the blame for the Steelcase job cuts on the economic climate created by NAFTA and other free-trade agreements that he says make Canada and the United States appear to be less attractive places to do business compared with lower-wage Mexico. "It's no different than what anyone else did at the time, including [former Ford CEO] Alan Mulally and others at Ford," he said. Dias said upcoming negotiations between Canada, the United States and Mexico should only serve to help moving forward. Last week, the Trump administration sent notice to Congress that it plans to renegotiate the free-trade agreement. Dias said Unifor will have an active role in the renegotiation of NAFTA. He said he met with U.S. Commerce Secretary Wilbur Ross on May 18 to discuss trade and the global automotive industry as a whole. He described their conversation as blunt and straightforward and came away heartened that someone with knowledge of the automotive industry would have a large role in the negotiations. Before being appointed as commerce secretary by President Donald Trump, Ross was known in the industry as the founder of supplier International Automotive Components Group, from which he is divesting. "It's a pleasure for me to talk to somebody that understands the industry," Dias said. Dias has often been harshly critical of Trump and his administration, but was encouraged that his campaign made the renegotiation of NAFTA a central tenant of the 2016 presidential race. He has also been regular contact with government officials in Canada at both the federal and provincial levels and said he is "encouraged" by their commitment to negotiate what he said would be a better trade deal for Canadian workers. "We're meeting a whole lot over NAFTA and TPP," Dias said, referring to the Trans-Pacific Partnership, which the U.S. backed out of earlier this year. "Frankly, I don't know how we can continue with the TPP without the U.S."
Dias praised Fields' short tenure as CEO, pointing to the high profits and strong financial indicators Ford had under his watch. He called Wall Street's apparent displeasure with Ford "hard to explain," but said he expects continued success under Hackett. "Mark Fields was incredibly successful," Dias said. "He brought Ford to levels nobody else was to." In the United States, request for comment from UAW leadership on the Ford shakeup was declined. The UAW typically does "not comment on internal corporate governance," spokesman Brian Rothenberg wrote in an email.